It’s an ambition of ours to reduce our impact on the environment and live a more sustainable life. The Little Black Shack is our attempt to do just that. We are by no means experts, and admittedly, it’s a bit of a work in progress at the moment, but we are working towards one day taking our 1350 square metres of paradise completely off the grid. Our aim is to be totally powered by the sun, grow, raise and catch as much of our own food as we can, make any furniture we need and collect all our water from the sky and the sea. We are passionate about sustainability so whilst it would have been much quicker and a whole lot easier (and cheaper) to knock the tiny old shack down, our only intention was to restore it and preserve its character and the environment. So just like the original owners we re-used and repurposed all the materials we could find on site and recycled absolutely everything during the rebuilding process. We then filled the shack with an eclectic mix of pre-loved furniture, collectables and family ‘finds’ along with pre-loved objects gathered from our travels around Australia and the world and forages along the beach. And in the true pioneering spirit of Mackerel’s early settlers, if we couldn’t find it, swap it, or recycle it, we simply made it. To some, our things may not look all that special, but they are to us. Because everything here contains a story or a happy memory and has helped us create a comfortable home whilst reducing our impact on the environment. Mackerel Beach is a very special place. What makes it so special is its remoteness and peaceful isolation. Whilst we see our pristine location as an absolute privilege and a place to completely escape, it also comes with a sense of responsibility and the need for self-awareness about how we live and it’s effect (good and bad) on our environment. Here are some of our ‘green’ features that are good for our environment and good for our guests. 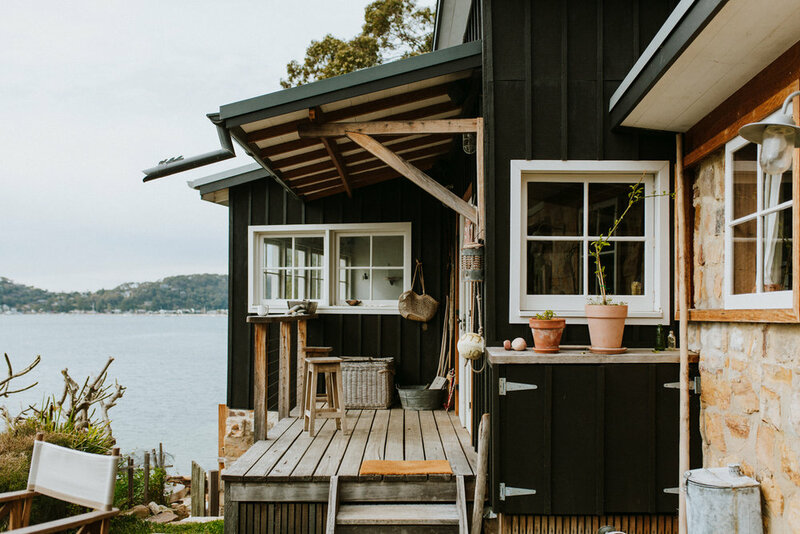 The Little Black Shack was originally hand built by fishermen and positioned to take advantage of Pittwater’s natural cooling and heating system. In the summer the cool water temperature and fresh sea breezes from the north east are more than enough to keep the house cool and comfortable on even the hottest of days. There are 14 windows, 4 barn doors and 2 French doors to let the breeze flow right through the shack. On the odd still day or night there are plenty of fans (second hand of course) to circulate the air and keep you cool. Outside there is plenty of shade to be found under the covered pergola, the classic retro beach umbrella, or under the two 70 year old frangipani trees. Then again, you can always walk down the front steps and dive into the crystal clear water to cool off. In the winter, the sea also regulates the temperature and its thermal effect actually keeps the shack warmer as the water temperature rarely drops below 17 degrees celsius. The northerly aspect means the shack is warmed by the winter sun all day long, while the hill behind protects against winter’s cold southerly winds. The hand-built, sandstone open fireplace heats up when the fire is lit and stays warm long after the fire is out. Lit by the soft glow of bare Edison light globes, quirky second hand lamps, a huge supply of candles and second hand oil burning lanterns, you may never want to turn on the lights – especially during full moons. The brass lights around the shack are as old as they look and were salvaged off old decommissioned ships. Everything in The Little Black Shack is second hand, found, re-purposed or hand made. Except of course the obvious things like linen, appliances, crockery, cutlery etc, every item has been collected from our travels, markets, recycling centres, second hand stores, the beach or the bush. Both bedrooms are furnished with cowhide rugs, antique cupboards and chests of drawers, handmade beds and 100% linen bedding. The big beautiful, comfortable beds are completely made from second hand timber. The king bed had a former life as a ramp to transport materials from the beach to the site. The queen bed is made from old timber salvaged on site. Sleep easy, the mattresses, pillows and all the bed linen are new! Speaking of which, the bedding is all 100% linen. We chose it because it feels great, promotes deep and relaxing sleep and is thermo-regulating. Pure linen insulates in the winter keeping you warmer. And because it’s antistatic and doesn’t cling to your body, in summer, it relieves the skin of excessive heat to keep you cooler. If that doesn’t help you sleep easier, linen is not only better for you it’s better for the environment. 100% organic and made from the flax plant, linen is grown without harsh pesticides and chemicals and requires little water in the growing process. Flax is a renewable resource and the linen produced from it is fully biodegradable. Finally, sleeping on 100% linen sheets is also said to significantly bolster female fertility. So you may well leave The Little Black Shack with ‘a little’ more than just memories! Everything that’s painted or stained at the shack has been done with Porter’s Paints - 100% Australian made, environmentally friendly, all natural and water-based. All paints contain Volatile Organic Compounds or VOC’s. VOC’s contribute to the pollution in the lower atmosphere and the degradation of our ozone layer. The natural Porter’s Paints used contain zero or extremely low VOC’s and are not only better for the environment, they are also better for you, decreasing asthmatic reactions and allergic sensitisation. To achieve the right colours and finishes, we even diluted the stains and paints using our own rainwater collected from the roof. We also recycled all building materials used on site. The old floorboards were used to make the kitchen cabinetry, the sturdy ramp we built to get materials from the beach up to the site is now the king size bed and old painters' planks have become a TV cabinet and a set of shelves in the downstairs bedroom. 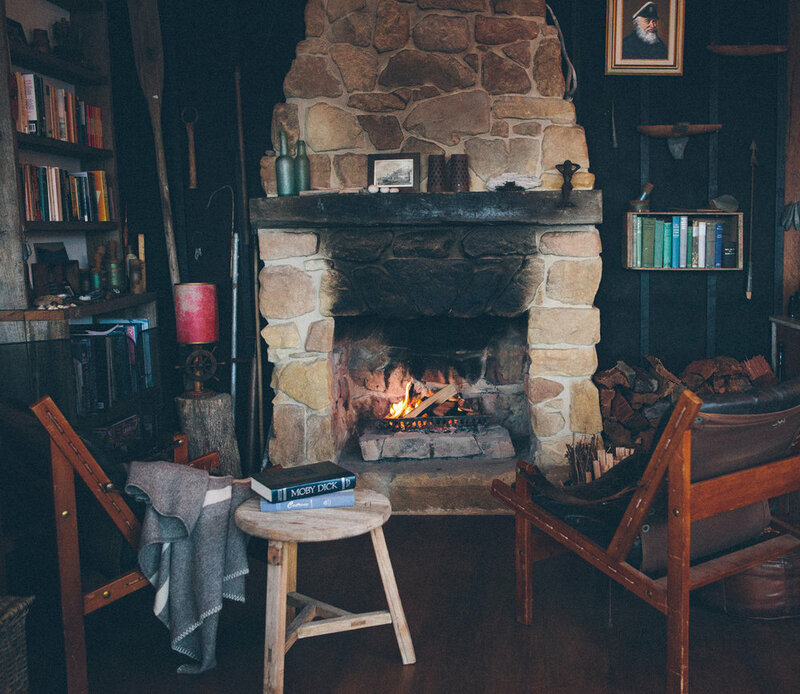 The large window boxes in the lounge room were made from second hand Oregon planks and any wood that wasn’t suitable for sitting at, sitting on or lying on, was used as firewood to heat the shack over our first winters. All our water comes from the sky, is collected from the roof and stored in small rainwater tanks near the house. We ask guests to please treat the water as the precious resource that it is and to use it wisely and sparingly. During times of drought we use our own desalination system that turns Pittwater’s clean salt water into fresh water more pure than Sydney tap water! Saving our water is as simple as using the half flush button, only turning taps on half strength and not leaving them running unecessarily while washing hands, brushing teeth or rinsing dishes and taking short showers (better yet, share one with your special friend)! We supply plenty of fresh bottled drinking water for your stay. Even the water you do use is not wasted. The shack’s toilet, bath and sinks are all connected to a wastewater management system. This system treats and filters wastewater into clean water and irrigates the garden (don’t worry not the kitchen garden)! We appreciate that being water wise is not everybody's cup of tea (although there's always plenty for that), so please consider if this is for you before deciding to stay.